Kill and frame the son of a high-ranking Imperial guard. Speak with Gabriella in the Dark Brotherhood Sanctuary. (Optional) Steal Gaius Maro's travel schedule. Kill Gaius Maro and plant the incriminating letter. For a bonus, kill him in a major city. When you return from your fateful visit to Vittoria Vici's wedding, you will find a gleeful Astrid ready to move onto the next phase of the plan. She instructs you to visit with Gabriella for the next mission. Gabriella informs you that with the Emperor traveling to Skyrim, the Penitus Oculatus will be securing the way. In order to disrupt the security surrounding the Emperor, you will need to cripple its head, Commander Maro. The Brotherhood's plan to accomplish this is to kill Gaius Maro, the commander's son, and plant a letter implicating him in a plot against the Emperor. Morndas evening Solitude, Castle Dour Food and sleep. Tirdas evening Windhelm, Barracks Food and sleep. Turdas evening Whiterun, the Bannered Mare Food and sleep. Fredas evening Markarth, Guard Tower Food and sleep. Loredas - To be spent at your discretion. Sundas - To be spent at your discretion. Don't be afraid to simply wait for a day and follow Gaius around. There is no time limit on this quest, and when Gaius has completed his schedule, he will repeat the same schedule next week. It is much easier to assassinate him on the road when he is alone, but you forfeit your bonus reward by doing so. Wherever you kill him, loot his corpse and plant the incriminating letter on his body, then return to the Sanctuary. Alternatively, you can reverse-pickpocket the note prior to killing him. Some strategies for completing the contract are to wait until he stays at the Bannered Mare in Whiterun. He will go to sleep in a room alone around midnight, allowing for an easy sneak attack. He might also be alone while he's eating in the Windhelm barracks. Conversely, his notes suggest that he doesn't actually sleep in any of the inns *or* the barracks in Riften, and seems to spend most of his time in the main hall with plenty of watchful eyes, so it might be wiser not to bother him there. Alternatively, you can speak to Gaius and provoke him into attacking you; this allows you to kill him in self-defense without a crime being registered. For this assault on the emperor's security, you will be rewarded with leveled gold. Gaius himself carries a set of rare Penitus Oculatus armor. If Gaius died in a city, you will also receive Olava's Token. The token will give you a miscellaneous quest to find an "assassin of old", which will lead you to a dead Dark Brotherhood member in a cave dressed with an upgraded version of every piece of Dark Brotherhood armor. 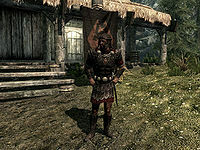 Since Dragon Bridge is part of Haafingar, the guards there will try to arrest you if you earned a bounty in Solitude during the previous quest, which will interfere with this quest. If this is the case, travel to Solitude first to clear your bounty. If you choose to follow Gaius he might get lost on his way to Solitude, and simply walk or stand around by the water near Solitude (possibly anywhere in Skyrim), or even swim in it. Fast traveling or waiting should make him remember what he is doing, and he might suddenly travel at a higher speed than you until he has caught up with his schedule. Sometimes when at the Bannered Mare in Whiterun, Gaius will never enter his room at all, instead periodically getting up and changing chairs before he leaves in the morning. After killing Gaius Maro, you can report back to Gabriella and she'll just repeat the line "Gaius Maro still lives. I am surprised. I had assumed you were more... competent." Similarly, after killing Gaius and planting the letter, you can report back to Gabriella and she'll just repeat the line "Why are you here? Killing Gaius Maro is but the first step of your contract - you must also plant the incriminating letter on his body..."
The quest token is required to receive a fortune reading from Olava the Feeble. If you are apprehended in Dragon Bridge by a guard, and you have a bounty, Gaius may not leave the town. Gaius and his father may be hostile to you and other citizens without reason. Being essential until they finish their initial conversation, this may cause the deaths of many residents of Dragon Bridge. If you kill Gaius in Riften and are caught by an Imperial Guard, the townspeople may riot in your defense. ? 5 Astrid informed me that I should speak to Gabriella about my next contract, which has something to do with the Emperor's security. 10 I must kill Gaius Maro, an agent of the Emperor's security force. Once he's dead, I must plant a letter on his body that will incriminate him in a plot to kill the Emperor. If I wish to earn a bonus, I must not kill him in Dragon Bridge, or on the road, but in one of the cities he visits. 200 Finishes quest I have killed Gaius Maro, and planted the Incriminating Letter on his body. This will surely disrupt the security plan for the Emperor's visit, ruin Commander Maro emotionally, and make the Emperor believe the only plot to kill him has been foiled. The following empty quest stages were omitted from the table: 0, 30, 255. On the PC, it is possible to use the console to advance through the quest by entering setstage DB06 stage, where stage is the number of the stage you wish to complete. It is not possible to un-complete (i.e. go back) quest stages, but it is possible to clear all stages of the quest using resetquest DB06.